And really, that's one of the joys of having a toddler: every little thing gives cause for shouts of glee. Discovering yesterday's toys awaiting you in the living room first thing in the morning is reason enough for joyful exclamation. Snow. Dogs, no matter how many you've already seen that day, are always a perfect excuse. And ice cream? Forget it. Simple exclamations aren't nearly sufficient; you need a Happy Dance as well. But last night I became a squealer. Just as I had given up hope of package deliveries for the day, the doorbell rang. My new sewing machine had arrived! How quickly can we get dinner made, the kitchen cleaned up, and Tsia to bed? Not fast enough. Once our jobs were completed, Todd sat down in the living room to read the manual for his own toy, err, business tool as I opened the carton and began my rolling discourse of exclamations: "Whoa: it cuts your thread for you at the end of a seam! In fact, it back stitches the ends of the seams for you as well! Oh my gosh: the food pedal has a retractable power cord! Did you see what this button does? This is amazing!" Needless to say, I had no idea what I've been missing in the sewing machine universe. And so far I've only tried the straight stitch! Oh, have fun! What a fun package - definitely squeal-worthy. The quilt is lovely. Oh, you are going to have so much fun with your new machine. Lucky you! this quilts is stunning...i love it! and hand quilted? i am bowing at your feet while i am typing this. you rock in a major way. 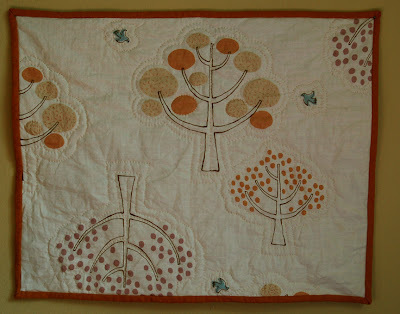 Love the quilt - so pretty and what a great fabric you chose. lovely quilt, and you make me want a new machine!! hurray for new toys! that quilt is really cute. and i didn't even know sewing machines could do such things - but then again, my sewing skills really only warrant an easy-bake-oven level machine, so i'll take one step at a time. and that doll quilt is so lovely. 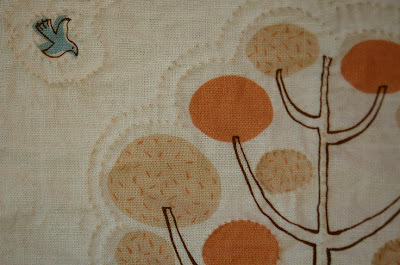 beautiful fabric and quilting! Oh I just love the quilt. I just made a big fabric purchase but I've been longing to buy the fabric you used. I think I may have to get some of that fabric too. Love the quilt!! Your quilt is beautiful! I have the same machine as you do. It's wonderful although it did take some time to get used to the speed! i LOVE this quilt! wow. congrats on the machine..im still learning how to use my first one..
love that little quilt!! too cute! Sooz, the fabric is printed and distributed by Kokka, but I'm not sure who the artist is. And Lynn, do you know that you can change the speed of the machine? The lever at the front can be adjusted to go any speed you want. Nifty, hmmm?